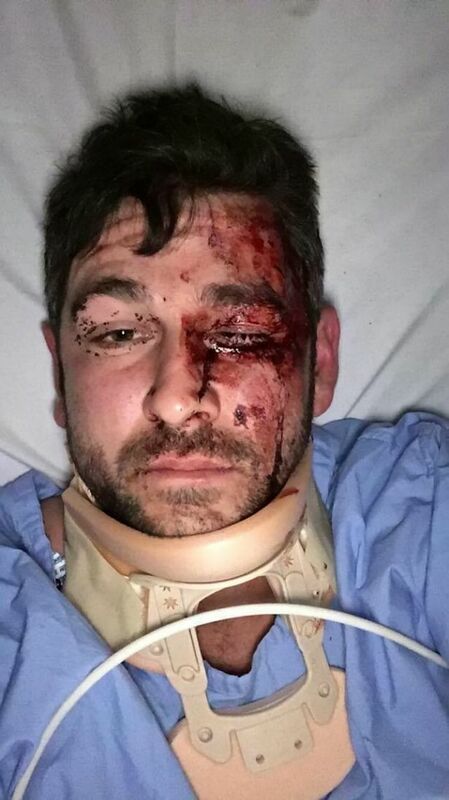 A Scots backpacker has told how he was “left for dead” in the street after he was brutally attacked by a taxi driver with a crowbar. Former cagefighter Euan Fraser, 30, said the cabbie beat him unconscious on his doorstep leaving him with a bleed on the brain. He claims the attack happened after he got out of the car in Melbourne following what he thought was a harmless discussion about religion. Euan, from Dundee, Scotland, was knocked out and medics did tests which showed he was struck with a thick metal pole, like a crowbar. He was forced to shell out £4,000 for his medical treatment and now suffers with Post Traumatic Stress Disorder. Describing the incident, Euan said: “As I got out of the taxi I just heard footsteps behind me and heard a loud bang. “Then I felt this immense pain in my head and I was knocked clean out. “I was laid into when I was on the floor. I was left laying there in a pool of blood. He left me for dead…. Euan, who stands 6ft 5ins tall, flagged down the yellow cab after a night out with a friend in Melbourne in June last year. He recalls how he and the taxi driver spoke “at length” about the driver’s Muslim background and he became visibly annoyed when Euan said he was an atheist. Euan, who was working on a farm at the time, argued that religion had “played a part in causing deaths and wars” throughout history. Architecture student Euan said: “He didn’t like it at all when I started expressing my views. He started to preach his religion on me. “I argued that science was responsible for evolution rather than religion, which he didn’t like either. “I tried to change the conversation but he kept going on about it. I could see he was getting wound up.” He got out of the car expecting the cabbie to drive off when he was smashed over the head and “beaten to a pulp”…. Euan sustained bruised ribs, a battered shoulder, multiple cuts to his face and a bleed on the brain during the sickening attack….